Every time we take off or land in an airplane, we take it for granted. Well, have you ever wondered what goes into airport development and design? If you think all you need is an open patch of land, a building with a roof, and a runway, you're wrong! As the airplane has developed over the last century, airports have had to keep pace with well-designed grounds and handling facilities that work for both passengers and pilots. When designing an airport, its position relative to the city it serves must be carefully considered. Airports that are too close to urban areas often receive noise complaints, while those too far away from the cities they serve are often considered inefficient. Runway design is also very important. While shorter, grass runways did the job just fine during the airplane's early years, today's larger, heavier planes mean that longer, asphalt runways are the norm. 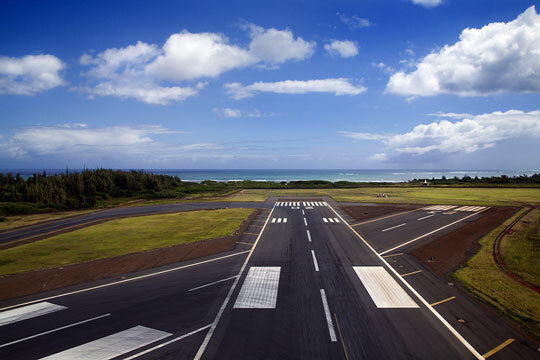 Runways are situated depending upon conditions such as wind directions and size, height, and location of obstructions in the area. While a few single-runway airports still exist, most of today's airports feature multiple runways. There are many different ways to design multiple runways — parallel in line, staggered parallel, or at right or acute angles to one another are common options. However the runways are oriented, they must work with the terminal. When designing a terminal, the two things most often considered are how the terminal links to the runways and how it connects to the outside roads. Some airport terminals are circular to allow for shorter distances between the terminal and runways, while other airports focus on being multi-leveled for passenger convenience — parking lots on the top floors, terminal gates on the middle floors, and baggage claim on the bottom floors is a popular configuration. Because the airline industry continues to grow by leaps and bounds — more passengers than ever are flying and planes are getting larger — many airports are designed with expansion in mind. Passenger comfort is also an important focus: covered walkways, mobile lounges, and high technology capabilities are popular features in modern airport design. In the USA, the Federal Aviation Administration offers guidance in all areas of airport development, from the planning and funding stages to the engineering, design, and construction phases. 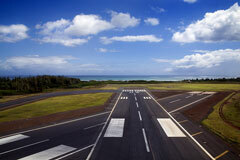 The FAA is also involved with airport safety, certification, and environmental issues. Completed airports are managed and operated by professional airport managers or airport management firms. In the USA, the AAAE (American Association of Airport Executives) represents the interests of these airport managers. In the wake of the September 11, 2001 terrorist attacks, the TSA (Transportation Security Administration) was created to strengthen the security of airports and other transportation systems in the United States. Hooks, Mike (1977). Airports. In David Mondey (Ed. ), The International Encyclopedia of Aviation . New York: Crown Publishers. Stroud, John (1978). Airports. In Bill Gunston (Ed. ), Aviation: The Complete Story of Man's Conquest of the Air . London: Octopus Books. Wells, Alexander and Young, Seth (2003). Airport Planning & Management . New York: McGraw-Hill. SH&E - aviation consulting firm dedicated to air transportation projects and design issues. RS&H - commercial aviation consulting and airport planning firm. Armstrong Consultants - airport engineering and planning services. This state airport map menu references airport map pages for all fifty states in the USA.